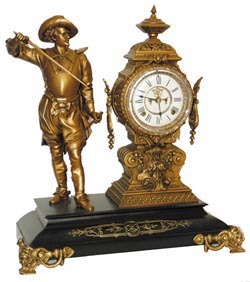 Ansonia Clock Co., figure clock, "Don Caesar", C. 1894. The base is black enameled iron with gold filled designs etched in the metal. Large metal feet. The clock tower and large statue are metal. The base, tower, and statue, have been professionally refinished in a Syrian Bronze color. The overall piece is 22" high, 19.5" wide. Typical Ansonia 8 day movement, half hour gong strike. Two piece porcelain dial, open escapement, rocco sash, beveled glass has one small chip. This is a nice looking statue clock. Ly-Ansonia #469.